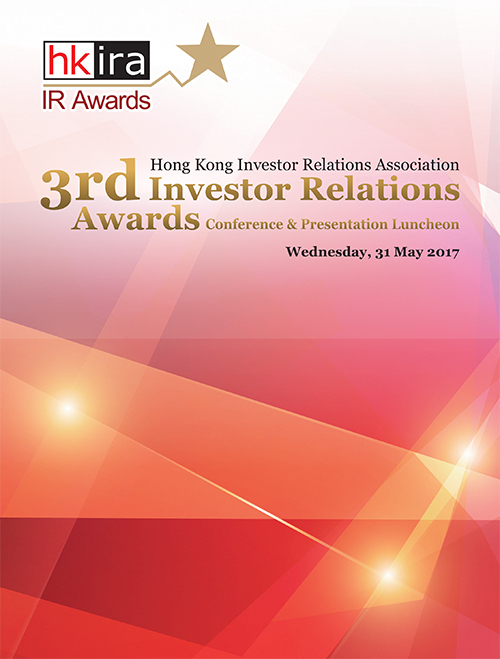 We are proud to congratulate all the award winners of the HKIRA 3rd Investor Relations Awards, which honor their IR excellence and best practice. Congratulations are also extended to all the nominees in recognition of their efforts made in pursing IR best practice. 2018 AAC Technologies Holdings Inc.
1528 Red Star Macalline Group Corporation Ltd.
1970 IMAX China Holding, Inc.
1811 CGN New Energy Holdings Co., Ltd.
0086 Sun Hung Kai & Co. Ltd.
0173 K. Wah International Holdings Ltd.
0177 Jiangsu Expressway Co. Ltd.
0179 Johnson Electric Holdings Ltd.
0200 Melco International Development Ltd.
0207 Joy City Property Ltd.
0215 Hutchison Telecommunications Hong Kong Holdings Ltd.
0242 Shun Tak Holdings Ltd.
0315 SmarTone Telecommunications Holdings Ltd.
0338 Sinopec Shanghai Petrochemical Co. Ltd.
0384 China Gas Holdings Ltd.
0408 Yip's Chemical Holdings Ltd.
0471 CMMB Vision Holdings Ltd.
0522 ASM Pacific Technology Ltd.
0552 China Communications Services Corporation Ltd.
0563 Shanghai Industrial Urban Development Group Ltd.
0605 China Financial Services Holdings Ltd.
0606 China Agri-Industries Holdings Ltd.
0609 Tiande Chemical Holdings Ltd.
0669 Techtronic Industries Co. Ltd.
0690 Uni-Bio Science Group Ltd.
0717 Emperor Capital Group Ltd.
0728 China Telecom Corporation Ltd.
0735 China Power New Energy Development Co. Ltd.
0738 Le Saunda Holdings Ltd.
0777 NetDragon Websoft Holdings Ltd.
0806 Value Partners Group Ltd.
0813 Shimao Property Holdings Ltd.
0825 New World Department Store China Ltd.
0867 China Medical System Holdings Ltd.
0868 Xinyi Glass Holdings Ltd.
0912 Suga International Holdings Ltd.
0926 Besunyen Holdings Co. Ltd.
0933 Brightoil Petroleum (Holdings) Ltd.
0956 China Suntien Green Energy Corporation Ltd.
0968 Xinyi Solar Holdings Ltd.
0991 Datang International Power Generation Co., Ltd.
0996 Carnival Group International Holdings Ltd.
1030 Future Land Development Holdings Ltd.
1107 Modern Land (China) Co., Ltd.
1117 China Modern Dairy Holdings Ltd.
1199 COSCO SHIPPING Ports Ltd.
1224 C C Land Holdings Ltd.
1260 Wonderful Sky Financial Group Holdings Ltd.
1278 China New Town Development Co. Ltd.
1313 China Resources Cement Holdings Ltd.
1314 Tsui Wah Holdings Ltd.
1333 China Zhongwang Holdings Ltd.
1339 The People's Insurance Co. (Group) of China Ltd.
1371 China LotSynergy Holdings Ltd.
1439 China Packaging Holdings Development Ltd.
1566 China Animation Characters Co. Ltd.
1610 COFCO Meat Holdings Ltd.
1628 Yuzhou Properties Co. Ltd.
1776 GF Securities Co., Ltd.
1777 Fantasia Holdings Group Co., Ltd.
1788 Guotai Junan International Holdings Ltd.
1818 Zhaojin Mining Industry Co. Ltd.
1883 CITIC Telecom International Holdings Ltd.
1929 Chow Tai Fook Jewellery Group Ltd.
1938 Chu Kong Petroleum and Natural Gas Steel Pipe Holdings Ltd.
1958 BAIC Motor Corporation Ltd.
1988 China Minsheng Banking Corp., Ltd.
2007 Country Garden Holdings Co. Ltd.
2138 Union Medical Healthcare Ltd.
2255 Haichang Ocean Park Holdings Ltd.
2318 Ping An Insurance (Group) Co. of China, Ltd.
2319 China Mengniu Dairy Co. Ltd.
2328 PICC Property and Casualty Co. Ltd.
2343 Pacific Basin Shipping Ltd.
2388 BOC Hong Kong (Holdings) Ltd.
2601 China Pacific Insurance (Group) Co., Ltd.
2688 ENN Energy Holdings Ltd.
2768 Jiayuan International Group Ltd.
2869 Greentown Service Group Co. Ltd.
2883 China Oilfield Services Ltd.
2886 Binhai Investment Co. Ltd.
3308 Golden Eagle Retail Group Ltd.
3331 Vinda International Holdings Ltd.
3377 Sino-Ocean Group Holding Ltd.
3380 Logan Property Holdings Co. Ltd.
3383 Agile Group Holdings Ltd.
3393 Wasion Group Holdings Ltd.
3800 GCL-Poly Energy Holdings Ltd.
3968 China Merchants Bank Co., Ltd.
3989 Capital Environment Holdings Ltd.
6116 Shanghai La Chapelle Fashion Co., Ltd.
6833 Sinco Pharmaceuticals Holdings Ltd.
8207 Credit China FinTech Holdings Ltd.
Ms. Victoria Mio Chief Investment Officer China, Co-Head Robeco Asia Pacific Equities Robeco Hong Kong Ltd.
We would also like to express our sincere gratitude to all those who have participated in the HKIRA 3rd IR Awards. Your contribution is essential in making the inaugural launch a great success. 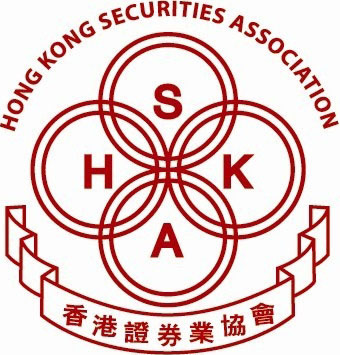 © Copyright Hong Kong Investor Relations Association. All rights reserved.